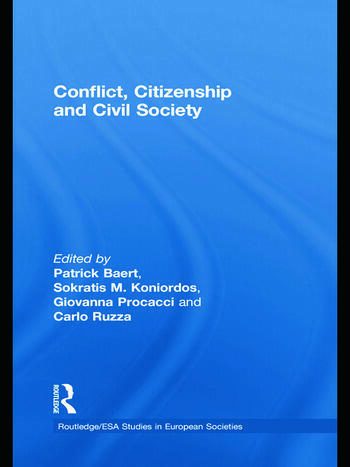 This book provides readers – students, researchers, academics, policy-makers, activists and interested non-specialists – with a sophisticated understanding of contemporary discussion, analysis and theorizing of issues pertaining to conflict, citizenship and civil society. It does so through thirteen pieces of most recent in-depth sociological research that delve on: challenges to citizenship, civil society and citizenship in early and late modernity, the reflexive imperative in transformations of civil society, social conflict challenges to social science approaches, methodology and explanatory power, gender, minorities-immigrants-refugees and the extension of citizenship, violence in modernity, the place of civil society for sociology, and postcolonialism, trauma, and civil society. Patrick Baert is Fellow of Selwyn College and Reader in Social Theory at the University of Cambridge. Amongst his publications are (with F. Carreira da Silva) Social Theory in the Twentieth Century and Beyond (2009) and Philosophy of the Social Sciences; Towards Pragmatism (2005). Giovanna Procacci is Professor of Sociology and Social Theory at the University of Milan (Faculty of Political Sciences) and member of CNRS-GRASS (Groupe d’Analyse et de Recherche sur le Social) in Paris. She has been member of the Institute for Advanced Study in Princeton, N.J., and fellow at the European University Institute in Fiesole; has taught in New York, Paris and Freiburg (Switzerland) and is member of several international journals (Citizenship Studies, Lien social et Politiques, European Societies) and sociological book series. She has been President of the European Sociological Association. Carlo Ruzza (MA SUNY, PhD Harvard) teaches Sociology at the University of Leicester and has previously taught at the University of Essex and Surrey. He has written on civil society, Europe and social movements, ‘uncivil society’, populism and the political right.